Back in the day, the day being sometime in the mid-to-late 70s when my mom kept herself busy sewing (along with appliqueing and decoupaging anything that stood still long enough) clothes for the both of us, she made purses out of old Levi jeans which were all the rage in that oh so groovy decade. I know that old trends are always resurfacing in new! and improved! ways (I must confess some bitterness over the new Footloose movie--the NERVE! Kevin Bacon's hair, mad dancing skillz and his Volkswagen can never be replaced. Tractor chicken, anyone?) so I thought I'd try to bring back the jean handbag trend by my little ol' self. Feel free to join me in this teeny tiny grass roots movement if you get the urge. 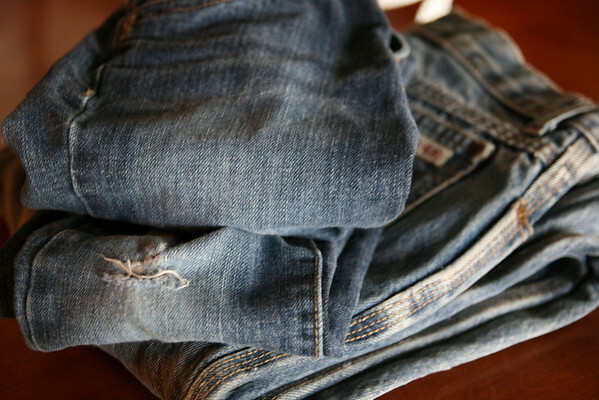 All you need is an old pair of blue jeans and basic sewing equipment. Annelise had a pair of jeans with a hole in the knee and I picked up a faded pair of Calvin Klein (because nothing gets between me and my Calvins) jeans at Goodwill for my bag. At first, I planned to turn her jeans into a skirt but the poor things were almost too tight on her rapidly growing body so there was no point (but I will make one in the future). 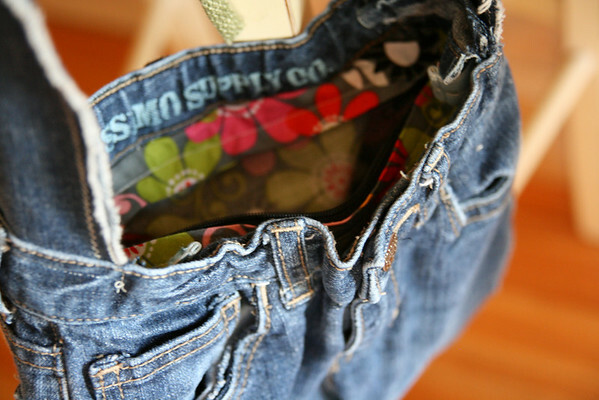 Decide how deep you want your bag to be and cut the legs of the jeans off at that point. Save the legs to make your straps. 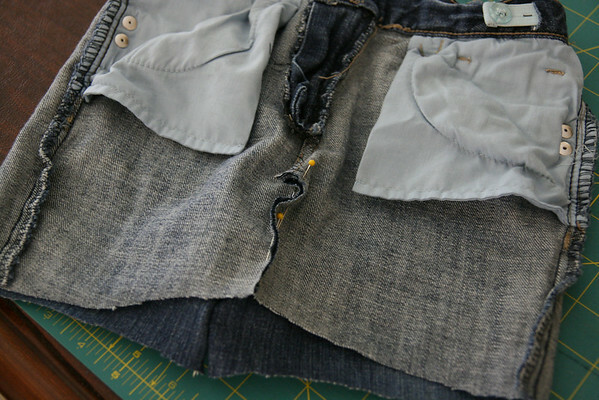 You can stop right there and call it finished if you decide you'd rather have cut-off shorts instead of a purse (whew! that was fast). To continue though with making the purse, cut off the inner leg seam and pin the sections together. You can be all precise and even if that's your thing and make sure the front and back is the same and there are not any puckers, or you can do it my way and say, "Eh, close enough", either way will work on this DIY project. I promise. 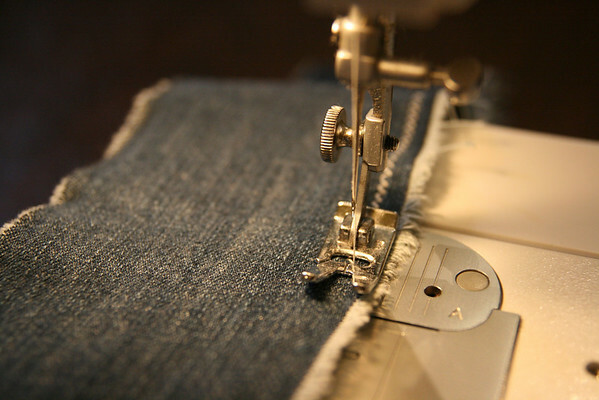 Sew the pinned sections together using a straight machine stitch. 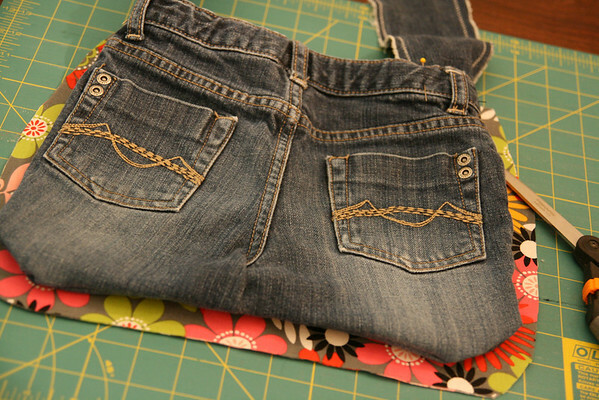 Pin the bottom section together and sew a 5/8" seam to create the bottom of the purse. 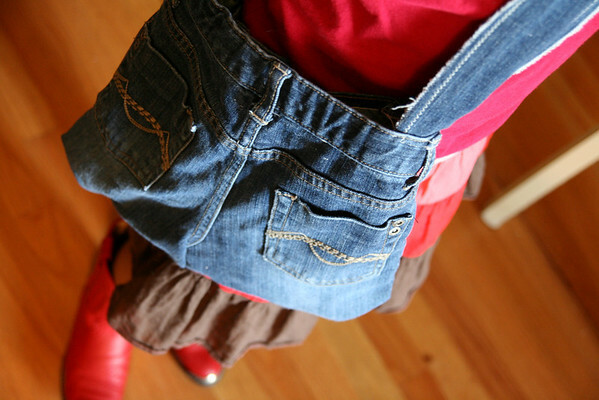 You can make a panel out of one of the cut off legs to make a wider purse bottom if you'd like. Since this was going to be for Annelise and she'd only be carrying essentials like lip gloss, gum and Star Wars figures, I kept things simple. Then, follow me here...make a pouch that looks vaguely like a wanton dumpling, pinching the ends together like this... Sew across the triangle on each side. This squares off the bottom of your purse and makes it more, I don't know, purse-like. Now it's time to make the straps... which is fun because you get to rip things. Measure the width you'd like (maybe 2-3 inches). 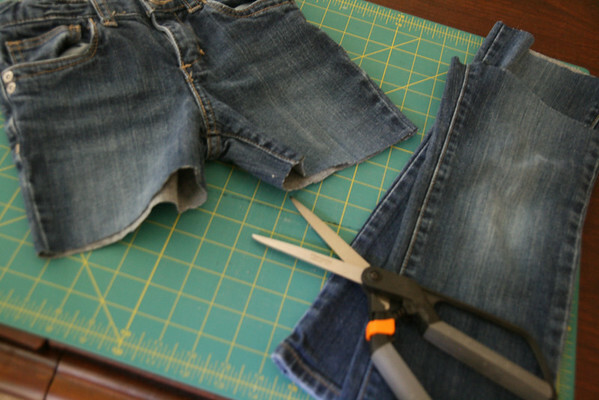 Make a small cut with your scissors then rip the remaining length of denim to create frayed edges. Annelise had requested a messenger style bag (apparently they are COOL), so I ripped four strips of denim, each about 3 inches wide, then sewed the strips together on the end to make two longer pieces. Then I sewed wrong sides together to make one loooong strap. I used a zig-zag stitch to help keep the fraying under control and add a little flair. Pin your straps to the sides of your bag and stitch in place. Now you are ready to make the lining for your bag. Thanks to my earlier sewing mishaps, I had some cute fabric on hand begging to be used. 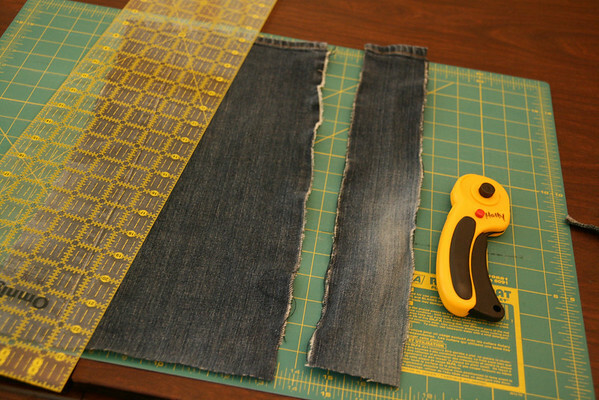 Using your bag as a pattern, cut your lining fabric (two pieces). Since I was sewing in my t-shirt and boxers and not ready for public display, I scrounged the house for a zipper I could, er...recycle. I found a pencil bag that had two zippers, because it's always nice to have a back-up. Having not sewn in a zipper since college, I quickly discovered my zipper skills were quite rusty. After viewing a few YouTube tutorials (God bless the Internet) I held my breath and tried my best. Sew your zipper onto your fabric first, then sew a 5/8" seam around the lining fabric edges (right sides together), then turn right side out. 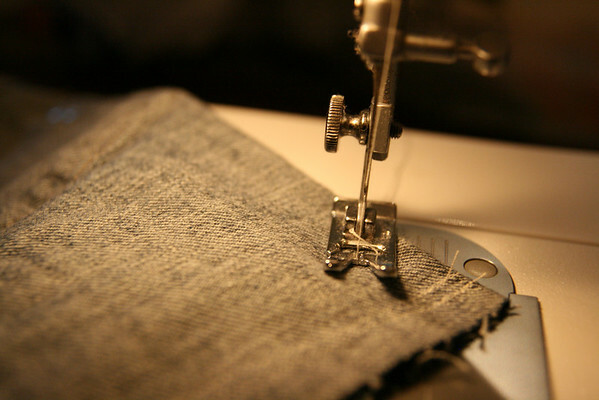 Pin your lining into your purse and sew in place (slowly and carefully because you're sewing through several layers). I ended up sewing the lining in by hand while we watched Little House on the Prairie on DVD because my machine was having trouble going through all the layers/belt loops. Did you notice I have no pictures of this part? Yeah, it wasn't pretty. Two zippers, one failed lining attempt, lots of one on one time with my seam ripper and I was finally victorious! And sweaty. 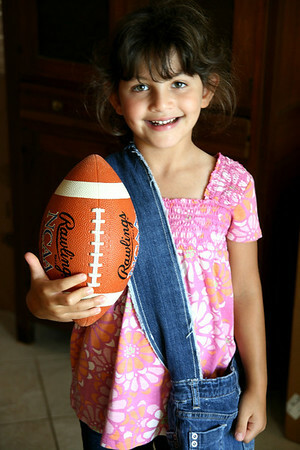 Annelise was beside herself with glee over her new jean purse and has been carrying it with her almost everywhere. The grocery store, church, the dentist...even to spontaneous backyard football practice. In a way I feel like I channeled my mom a little and came full circle in a way by making a jean handbag for my daughter like my mom had made for me (although she probably didn't break two needles and need a back-up zipper). It was oddly satisfying, yet left me feeling a wee bit sappy and sentimental. Now I guess I better hurry up and make mine so Annelise and I can be repurposed denim jean messenger bag MatchyMcMatchersons. I know, I know, y'all are green with envy. You've got mad sewing skill here! I'm loving all your sewing creativity lately! Thanks Patsy and Jill! It's been fun--frustrating at times too--but still fun. 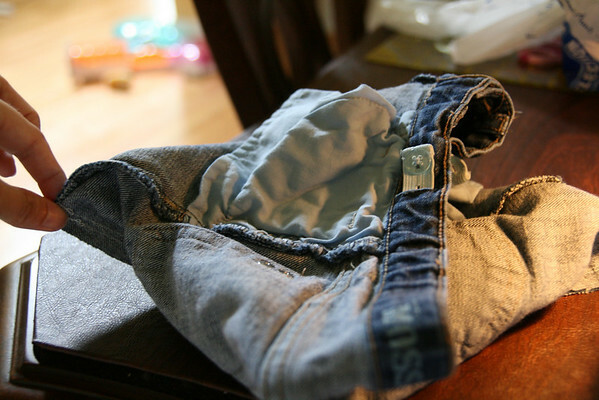 when my son cleaned out his room late last year, he found some leg portions of some old pants. the kind that you zip off and they become shorts. one set was khaki green and the other camo. my mom sewed the green ones into a book bag (maybe used another scrap added too) and the camo for the strap. really cool!! Silken: That's so cool your mom turned those pant legs into a book bag--I'd love to see it. The camo strap finishes it off nicely I bet!